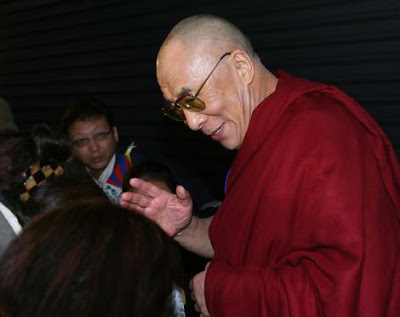 The Dalai Lama blesses monks from Sydney's Tibetan community moments after arriving in Sydney. Buddhist leader the Dalai Lama has arrived in Sydney, greeted by a large and colourful contingent of Sydney's Tibetan community. The Nobel Peace laureate, in Sydney to lead five days of meditation teachings, said he was "looking forward to meeting the Buddhist community and the Australian public". Looking relaxed and fresh despite his flight being delayed by 12 hours, the Buddhist leader stopped to greet many of the 100 plus members of Sydney's Tibetan community who were decked out in traditional garb and who carried white scarves for His Holiness to bless. "This is not a political visit, but just having him here is a huge boost for the Tibetan people," Mr Gaden said. Other members of the community said they were disappointed that Prime Minister Kevin Rudd would not be meeting their leader during his visit. "It is sad that Mr Rudd is feeling pressure from China," one supporter, who did not wish to be named, said. "Mr Rudd has lost some dignity, I think, by bowing to them." The Dalai Lama will head to Sydney Olympic Park this morning to begin his teachings, which are expected to attract up to 5000 Buddhist devotees from across Australia and the Asia-Pacific region. His visit will be marked by the toughest security measures ever introduced for a Tibetan leader, amid concerns of protests by Chinese students and a Buddhist splinter group, The Western Shugden Society.